Thank you for choosing to exhibit at, and support, this year's HAuNTcon. In order to make your experience the best it can be, please refer to the information and tools below to plan and prepare for the show. Please review the Vendor Checklist - a valuable tool for staying organized and aware of any approaching deadlines. This page outlines all of the logistical details that will help you to have the most productive exhibiting experience. 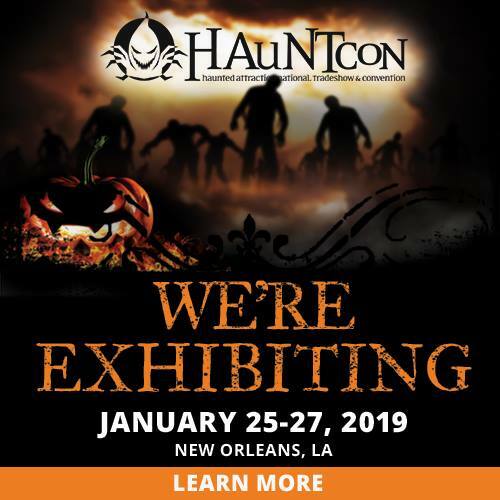 There can be a lot to do, but the information provided will help you plan your participation at HAuNTcon in a timely and cost-efficient manner. Please note: Connections Housing is the only official housing company associated with HAuNTcon. While other hotel resellers may contact you offering housing for your trip, they are not endorsed by or affiliated with the show and entering into financial agreements with such companies can have costly consequences. Compusystems is our official provider of lead retrieval systems. Click here for the official Compusystems order form. Each individual from your company attending the show is required to have an Exhibitor Badge to access the exhibit floor. You receive 2 exhibitor badges per 64-100 sq ft. Register for your badges through your Online Vendor Portal. Be sure to update your company's listing in your Online Vendor Portal. This appears in the Online Directory and the printed Show Directory and is what attendees use to plan their time at the show. You will also be able to add press releases, product information, show specials and much more to your online listing. Show off what you'll have on the show floor! Log into your Online Vendor Portal and upload your new products and any exclusive deals and discounts you will be offering on the show floor to get the buzz going! 1 Product and 1 Show Special are included with your booth. Let your buyers know that you'll be exhibiting! Invite your customers and prospects to the Show with a FREE 3-DAY TRADESHOW ONLY PASS! Download the official Show brag badge here and post it on your social media channels. Be sure to link to this page for the discount offer. Join us on Saturday, January 26th from 8PM - 11PM for THE industry party of the year. Get a chance to network with buyers and enjoy a night out with your fellow industry peers. Costumes aren't mandatory but they are encouraged! Learn more about the amazing city HAuNTcon is taking place in! Click here to see all that the city has to offer!